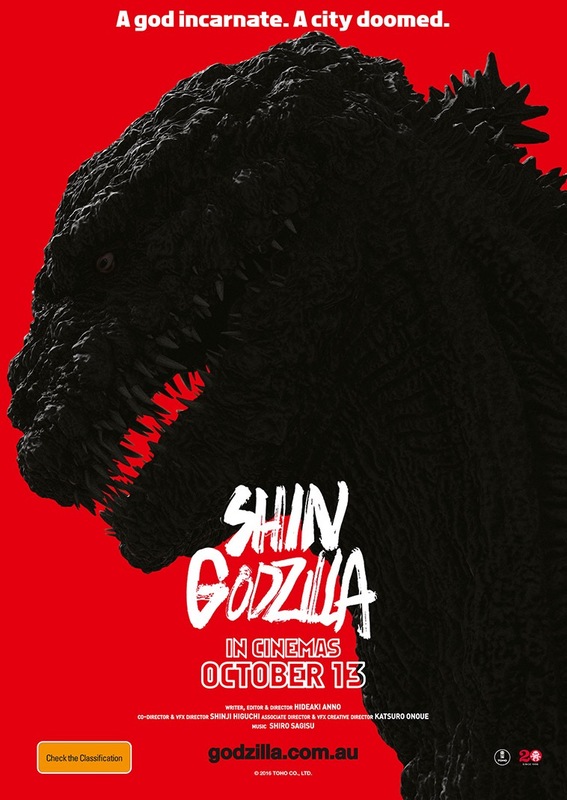 Shin Godzilla is having a limited showing in Sydney, and as this film was directed by Hideaki Anno, the famed director of Neon Genesis Evangelion, I decided to go and watch it. I highly enjoyed the movie, but before I elaborate on what makes Shin Godzilla a great Godzilla movie, I will warn that there are spoilers below, though I will try to be vague about specific plot points. To start off, Shin Godzilla is the first Toho Godzilla movie in twelve years and is a reboot that introduces a new Godzilla. It is also one of the few movies that only features Godzilla and not other kaijus, with the entire premise of the film based on the Japanese government’s response to the emergence of this new colossal monster. In fact, Godzilla has very little screen time with most of the focus being on the politicians and the process of bureaucracy that strangles the initial response to Godzilla. The movie features a lot of talking, at times moving quickly between different people in the political chain, yet I followed the flow of the scenes relatively easily (though the subtitles were at times a little all over the place). Where the original Godzilla reflected the horrors inflicted by nuclear weapons, Shin Godzilla offers a commentary on a different kind of nuclear disaster, the Fukushima disaster. The scenes of meetings upon meetings, a Prime Minister paralysed by the choices presented and government messages that immediately are proven to be lies are a well-presented critique of the Japanese government’s handling of the Fukushima disaster (apparently Anno consulted with former politicians who were part of the response to the disaster). This first act was great because it was a political drama where there wasn’t a good response to the problem, and you just see man helpless against Godzilla. Even when the politicians are able to form a military response Godzilla remains triumphant. One of the few action scenes presents attack helicopters and rows of tanks arrayed on a river bank (a scene very much out of Evangelion) doing absolutely nothing to Godzilla. But the true money shot is when the US attempts to stop Godzilla, revealing this Godzilla’s amazingly overpowered abilities. Godzilla firing his radiation breath beam is awe incarnate, and probably one of the best scenes of mass destruction I’ve seen in a movie. They definitely establish the massive danger this Godzilla poses and that nothing short of a nuclear weapon would be enough to stop him… possibly. The second half of the film offers an interesting look at another side of Japanese identity – its relationship with the United States, which historically has been a relatively subservient one, and how that relationship may change in the future. This is in context of the possibility of having another nuclear bomb dropped on Japan, but this time willingly and necessarily for all countries involved. Wherein lies the impetus for the main cast to seek an alternative solution, not only to avoid a disaster, but also to establish Japan’s position on the world stage. Unfortunately, the movie dwells a little long on the finding a solution part, and I think the film would have benefited from having a few talking parts cut while still retaining the general plot of the latter acts. However it all comes together in the end, with a very, very interesting ending to the Godzilla problem with two highlights – one being a scene of incredible sacrifice, the other being a really good setup for any sequel in this Godzilla timeline. Whether we will get that sequel remains to be seen, as Anno (like many other directors who’ve worked on the Godzilla franchise) will not be returning for another Godzilla film (and finally can finish off Evangelion), and who knows if Toho will continue this timeline with their next film. I highly enjoyed Shin Godzilla, but know that if you do watch it the film is a political drama first, garnished by roughly three action scenes, one of which is absolutely amazing and will leave you hyped about this Godzilla. I’m glad for the political commentary, but I hope Shin Godzilla the monster will get his chance to shine in a kaiju battle sequel.